People tend to love sparkleberry shrubs because of their attractive appearance and the fact that they bring butterflies to their gardens. Thinking about growing one or a few yourself? Read on to learn about this plant. The sparkleberry can be either be a large shrub or a small tree. It is the largest species of Vaccinium in the United States. The designation for this shrub is Vaccinium arboreum and it belongs to the Ericaceae (heath) family. In addition to the Vaccinium shrubs and subshrubs like blueberries and cranberries, this family also includes members like the bearberry (Arctostaphylos uva-ursi), strawberry tree (Arbutus unedo), common heather (Calluna vulgaris) and azaleas (Rhododendron spp.). This shrub may be called sparkleberry, Missouri farkleberry, winter huckleberry, tree sparkleberry, tree huckleberry, sparkle-berry, or farkleberry. The suggested zones for this shrub are Zones 6 to 9. It is native to the southeastern United States. This shrub is usually 6' to 20' tall, though it will sometimes form into a small tree that can be over 30' tall. This shrub may be grown in full sun to partial shade. Sparkleberry leaves are 1" to 3" long and may have either an obovate (egg-shaped) or elliptical shape. In autumn they can become shades of red. 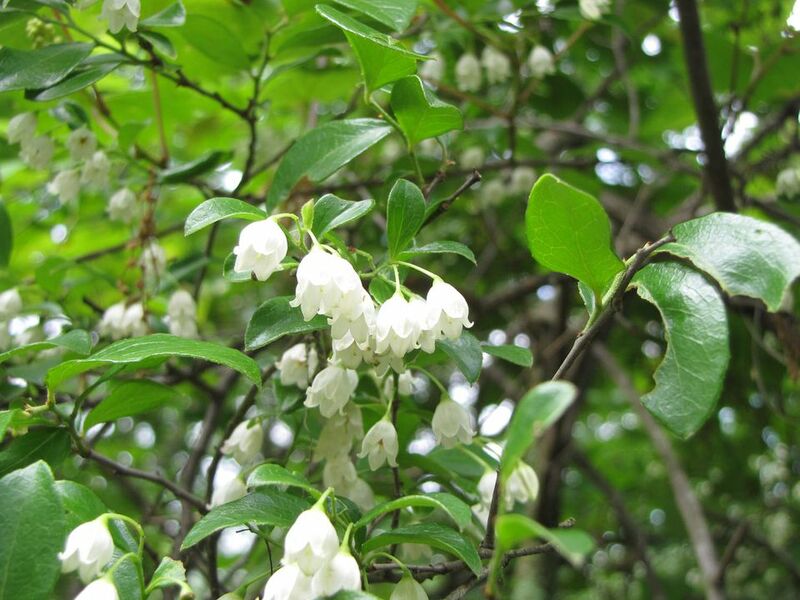 The white flowers are shaped like bells and appear in clusters called racemes. The epigynous berries are purple and shiny (inspiring the common name) at maturity. They are technically edible, but wildlife finds them much tastier than humans do. If you do not have acidic soils, this is the Vaccinium for you! The other members of the genus are known for their need for acidic soil. This species can also tolerate neutral and alkaline soils. This shrub can handle some periods of drought if its roots have had a chance to establish themselves. You will likely not have any pest or disease problems associated with this shrub.